2.3 What Are Faucet Aerators and What Do They Do? Why are kitchen faucets so important and how do they affect our life? There’s’ one essential device in every kitchen that is not appreciated enough: the Kitchen Faucet! It helps prepare delicious meals and the cleaning up process as well! Are you aware of how much you use it? A study conducted by the American Water Works Association states that an average faucet runs about 8 minutes per capita! Indoor water use is estimated at about 69 gallons (261lt) per day and faucets usage is the 3rd highest contributor with 11 gallons per person! If you care about both health and wealth, it would be wise to take a look at the following kitchen faucet reviews and see what you can contribute to water preservation! The best kitchen faucet can differ by usage and its purpose. Luckily we’ve reviewed the best for you! Moen, being “dedicated to designing and delivering beautiful products that last a lifetime” has brought a bold look that can fit into any kitchen design. The High Arc Kitchen Faucet detects what you’re up to and provides a strong flow the moment you need it with the MotionSense technology. The convenience this faucet provides is enabled with two advanced sensors; one at the top and one on the base. The Reflex System and 68-inch hose give an endless convenience when it comes to maneuverability. Plus, the hose returns to its original position smoothly and automatically. Sticky and stubborn stains on the floor of the sink are blasted away with the Power Clean technology. You can clean your dishes with more power, make less of a mess and save a great deal of time and water. The Arbor pulldown wand two spray modes; an aerated mode for a more gentle and every day use and a powerful rinse mode for heavy scrubbing too! Get ready to cut back on cleaning time thanks to the Spot Resist stainless finish. No fingerprints no water stains! Get ready to say hello to a gorgeous kitchen. Beauty powered with 6 AA batteries. For those who spend a great deal of time in the kitchen, both aesthetics and functionality is important! 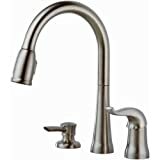 KOHLER is a leading brand as we all know and the Sensate Touchless Kitchen Faucet is a time and money saver as well! CLEAN KITCHENS CAN BE TRUE! You’re in the kitchen, cooking, your hands are messy and/or full! The Sensate Touchless kitchen faucet has a great response time with 20 milliseconds! Receptive to both your hand and pot or pan, the state of the art sensor enables convenient and hygienic usage, so goodbye to messy kitchens! Ergonomy is a very important issue in every aspect. KOHLER’s new magnetic docking system secures the spray head in its place. It also has spray and stream feature. The swivel joint head is ideal for effortless maneuverability. The lasting finish on the outside prevents corrosion and wear whereas the double ceramic valves on the inside ensure a lifetime of exceptional performance. It Works on AC power so you don’t need to go through batteries. It also allows manual usage for power outages. 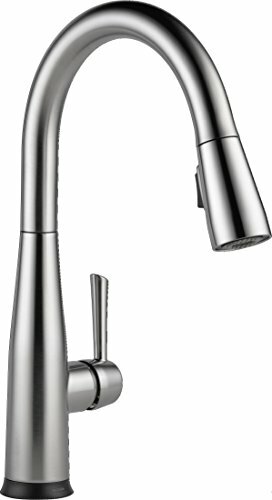 This vibrant Stainless KOHLER faucet can complement a variety of kitchen styles with its design. The composure also simplifies maintenance and cleaning. The height of the arc allows multiple tasks to be performed, and the spout design along with 360-degree rotation is a loveable feature. Pull down the spray-head for up-close scrubbing needs or simply to fill a pot out of the sink. The Stream Mode is good for filling up pots and pans whereas the Sweep Spray mode is conventional for superior cleaning. In addition to these two functions, there is a Pause Mode which enables you to switch between tasks, create less of a mess and save up on water! The ProMotion Technology gives the spray-head extra ease and comfort in use. Its’ light and braided hose and swiveling ball joint rendering your tasks almost effortless. And to top it off the magnetic docking mechanism inside the spout sends the spray-head back to where it belongs securely. The MasterClean Sprayface is easy to clean because of its resistance to mineral build-up. The Simplice spray-head has a solid sculpted button which allows you to command this functional faucet even with wet and soap covered hands. And to top it off no batteries required to operate this sleek and stylish faucet! The Kraus Mateo Single Lever Pull Down Kitchen Faucet has an all-metal body built for maximum durability. As a leading manufacturer of kitchen fixtures Kraus brings professionalism to the home chef. The dual functioned pull-down spray-head can swivel around 360 degrees, enabling complete sink access along with a comfortable grip. High performance/low flow Neoperl aerator helps save up on water consumption without compromising the pressure you may need. One of the likable features of this Kraus faucet is Kerox ceramic cartridge which enables lifelong drip-free usage and it comes with a limited lifetime warranty. The exterior finish is corrosion and rust resistant. The precise engineering and selection of Premium materials will put a smile on your face! QuickDock DIY Installation enables you to install your lovely but durable faucet from over the counter, no more sneaking under! The all-metal lever on the side allows you to control flow and temperature, splash free and without worrying about future malfunctions. The Leland Pull-Down Kitchen Faucet is a great example of traditional style and modern functionality. This beautiful kitchen fixture is available in Venetian Bronze, Chrome and Arctic Stainless finishes. Time to treat the eyes of the chef! By tapping anywhere on the spout or handle of the faucet with any place available you can start and stop the flow of water easily. Delta is truly committed to water preservation and is one of the first in the industry. The pull-down spray-head comes and returns with a gentle pull. The wand connects magnetically as you return it to its place, hence no droop over time! With the faucet handle, you can easily control the water temperature with its ergonomic handle. The Diamond Seal Technology equips the faucet with a diamond coating and the InnoFlex PEX waterways keep water away from potential metal contaminants. This beautiful fixture promises up to 5 Mil. Uses! These Touch-Clean faucets allow you to wipe away build-ups with the touch of a finger! This beautiful system requires no lubrication and is easy to mount as well. No leaks, no problems, all efficiency and beauty! The Touch on / Touch off tech powered by Delta Touch2O Technology comes with a 5 year Limited Warranty. The colored TempSense Technology shows the water temperature. The Diamond Seal Technology, MagnaTite Tech (magnetic docking system) and Touch2O Technology create an environment of reliability and high performance. This beautiful fixture is available in Artic Stainless, Chrome, Venetian Bronze and Matte Black for the bold! Whichever your eyes and heart desire! This easy to install faucet provides a lifetime of reliable service with its Diamond Seal Technology. Plus it is very easy to install! You can look forward to no leaks at all! Its style is both contemporary and transitional so don’t worry if it will fit in with your kitchen. And it is incredibly user-friendly; just touch anywhere on the spout or handle with your wrist or forearm to start and stop the flow of water. The docking system is reinforced with magnets so it’s pretty easy to put back in place! The TempSense LED light changes colors to indicate the temperature of the water. It also has a smart memory as it remembers if you left it on spray or flow mode and restarts accordingly! The DIAMOND Seal Technology and diamond-coated valve keeps your beautiful faucet from dripping and causing headaches! Plus the warranty ensures you to use this lovely faucet for approximately 5 million times! Water is not only a thing we use but an element that influences each and every day, so this technology helps you cherish the value of water on a daily basis. Delta is a brand for consumers that truly care. This beautiful faucet’s figure is inspired by the form and lines of the Taj Mahal so you can expect a special kind of serenity whilst cooking in the kitchen! The stainless steel exterior just explodes with sophistication and elegance! The Delta MagnaTite Docking system easily allows the spray-head to return to its rightful place. Delta’s consumer inspired and engineering revolutions allow you to control your water flow with a simple touch. The In2ition Two-in-One Shower is truly an intuitive quality giving you the chance to choose between an integrated shower head and hand shower. Whatever your task may be Delta provides the need! As other Delta fixtures, this model doesn’t require battery power and comes with a 5 million use guaranty. The height and distance from the sink enable you to easily fill pots and pans, clean inner sink messes without a hassle. The high-arch has a 360-degree swivel capability that gives total sink accessibility and the Touch-Clean Spray Holes make removing mineral build-up easy. Say goodbye to finger prints and water spots with the chic Spot Resistant exterior. 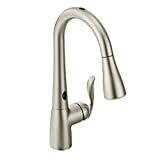 MOEN’s High Arc Pulldown Kitchen Faucet is tailored to fit almost every kitchen design that comes to mind. A simplistic, tidy and elegant look for you. This single mount, one handle faucet‘s height allows you to fill or clean any pot you desire. Plus the pull-down spray-head offers endless maneuvers capability whatever the task may be. The hose has an impressive 68-inch length which eases you through your daily routines. The spray-head also returns to its place without a hassle. The fine exterior allows you to spend more time enjoying your beloved home than it requires cleaning it. You can start loving your faucet during installation thanks to the Duralock Quick-Connect Installation System, you barely need any tools! This great system comes with a lifetime guaranty and requires no batteries as it works on AC power. Here’s Delta again with more answers to question you didn’t know you had! Those familiar with the brand already know the MagnaTite Docking system which keeps the hand spray in its rightful place after use. The DIAMOND Seal Technology is a patented application which prevents dripping and leaks. The Touch-Clean Spray Holes let you easily clean up the mineral clean up with the tip of your precious finger. They say most owners experience an amount of relief while installing this lifetime warrantied fixture. In addition to being a wonderful product you probably won’t need a plumber to put it in. The easy installation is a great beginning to water preservation and finesse. It’s designed to be easy but it also looks great. This magnificent instillation comes with a soap dispenser and is a 3 hole system. Professionalism and elegance hand in hand. Working on AC power, so no batteries required. Admit it. If you’re looking at MOEN you’re fed up with finger prints and water marks. You may not love Spot Resistant textures but you know you need it. The Moen Brantford Kitchen Faucet makes a traditional kitchen space feel special. The spray-head, the handle, they speak the language of elegance! Don’t just see it as a faucet; the innovative Moen’s Reflex and PowerClean make everyday chores both bearable and even if it may enjoyable. The Pulldown Reflex System comes with a 68” hose, so you can literally take care of any chore you have at hand! This convenient hose smartly returns to its place via its magnetic installations, smoothly and securely! You can easily install this beautiful fixture without excessive tools. The Dualock Installation System allows water lines to connect without the risk of leaking. With this great system, you acquire a great deal of pressure without wasting a lot of water! So you can clean your dishes in a jiffy or prepare a delicious meal in no time at all! The Brantford pulldown comes with two spray modes for complete efficiency. A variety from vegetable washing to heavy-duty scrubbing at the tip of your hands. In addition to all these fabulous qualities you can buy this fixture with a clear and clean conscience because it comes with a Limited Lifetime Warranty! Here are more than a few aspects you have to keep in mind while choosing the best kitchen faucet for your home! You might fall in love with a chic and shiny fixture but remember! Function and ergonomics are equally important if not more! 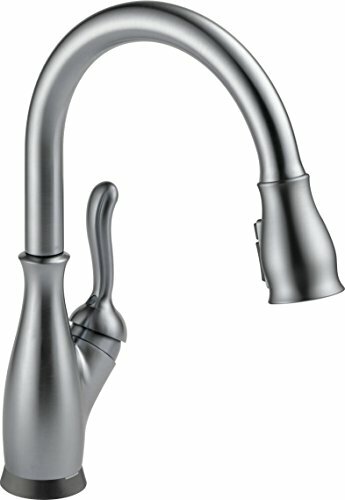 Faucet mounts vary from wall mounted and sink mounted. Wall mounted faucets are fixed faucets with limitations of usage. The tap can only pivot to the right or left and the nozzle usually doesn’t pull out. Plus, if you have over storage cabinets above your sink you may not be able to choose this type. Spout reach and height must be taken into consideration as well. These lengths determine how efficient you will use the faucet you choose. Sink mounted faucets allow the water flow to reach the middle of the sink and these fixtures usually are accompanied with pull out spray heads. You must be sure the water inlets are consistent with your homes’ water lines! Both types of fixtures consist of temperature levers. Dual (hot – cold separate) levers are more traditional whereas single lever faucets seem more appealing and also easier to use these days. Also, check out which kitchen sinks are the best? Traditional faucets usually come in shiny chrome textures, but these days stainless steel is more efficient to use. The surface of the kitchen faucet you choose must be corrosion and stain resistance. Of course, it has to look good, but will you still adore your faucet if you have to spend a great deal of time cleaning it? Most leading brands come with chrome, bronze and matte black designs which look really great and don’t require a lot of cleaning time. There are many designs that will blow you away! Newer technologies are mostly spot resistant! Those who have large kitchens prefer double sinks. You can pile your dishes on one side while washing on the other. If you own a double sink it is important that the faucet fixture has a wide rotation span. And if you have a lot of deep pots and pans you prefer to wash by hand, it is also important that you consider the height of the arc. If you use a single sink and have limited space, you might want to consider using a single lever faucet. Our kitchen habits are what determine the type of faucet we choose. If you do a lot of outer sink filling, a pull-out spray-head is a necessity. Pull-Out and Pull-Down Spray-Heads simplify kitchen chores and tasks immediately. Pull-out fixtures usually have longer hoses to be able to complete outer sink tasks with ease. These types of faucet heads are essential if your kitchen has a limited amount of space. The spray head is usually more flexible so you will be causing less of a splash with this kind of spray-head. On the other hand, pull-down spray hands have the company of gravity, hence giving these types of kitchen fixtures the upper hand in heavy-duty scrubbing. Pull down faucets are also ideal for those who own deep pots and big pans. The extra height gives more maneuverability and more flow power. In the end, it is completely the end consumers’ choice of which to choose from but pull down systems are more useful in industrial kitchens and the modern day cook is not to be underestimated! Faucets come from a long and sturdy past origin. There are Single hand units, which require a single or double hole setting depending on the capability of controlling the temperature of the water. Double hand units where you can command hot and cold separately. They need 3 different holes to adapt the unit to the sink or countertop. There isn’t a definitive difference amongst single or double handle faucets. Modern-day faucets can achieve the same task with a single lever! Sprayers on another hand are specially developed components for kitchens. Some models include the faucet head and sprayer piece together. Today you can find faucets with the sprayer on the side or even integrated into it. What Are Faucet Aerators and What Do They Do? Aerators have very interesting design and features when considered. They are classified on the basis of their flow rate and the type of flow they generate, aerated (spray) or flow. These pieces are also essential in the maintenance of such fixtures due to the mineral values of local waters. Faucet aerators consist of three main components; a housing, mesh filter and rubber washer. The mesh is the hardest worker by filtering the water and limiting the water flow. By decreasing the water flow and pressure we can save up on water and our money! Check out the post to learn about faucet water filters. Maintenance of aerators is easier than you think. Most systems are easily screwed off. You can turn it over and remove the debris that has come through your pipes. You might feel the need to do this if the pressure and flow decrease over time. You may also consider using vinegar to clean the mesh insert. It’s not rocket science knowing that we need to preserve our natural water supply to sustain a livable life. Water consumption starts with the simplest action and from our homes. Estimates vary but water consummation varies amongst people between 81-100 gallons per day per person in each household! Take a shower, flush the toilet, wash your dishes! You are consuming our earth’s resources. It’s impossible not to use water, our body is roughly composed %65 of water! And whether we eat or wash, water is an element we cannot give up on! Censored water fixtures aren’t just a fancy addition to our households. They are appliances that respond to hand gestures in 20 milliseconds and help us from wasting excessive amounts of water! The average person wastes about 8-27 gallons of water by washing dishes by hand! And the amount counts on the efficiency of your dishwashing. Newer faucets use about 1,5-2,0 gallons of water per minute whilst washing dishes. Water saving dishwashing techniques include installing an aerator to your faucet and not letting the water run excessively! So you can grasp the importance of censored faucets are much more than luxury! Please be aware and go look at your kitchen and bathroom faucets, if you look at the head and see something like “1.0 GPM”, this means that the faucet head will allow water to flow at a maximum of 1.0 gallons per minute. So you now know how much you can attribute to save the planet! Censored or handless faucets are equipped with motion sensors and open their valves upon the presence of solid material and allow water to flow. These faucets close again after a few seconds or when they no longer detect the presence of a hand. Sensory faucets can be battery or AC powered. The first introduction of automated sensory faucets was in public restrooms but this realization brought this awareness back into our homes. We truly are not aware of the amount of water we consume! Sensor-based automatic faucets were first developed back in the 1950’s but were produces for general and public use in the early 1980’s. In the year of 2019, we don’t have the luxury to waste our resources without consequences! The automatic shut off mechanism of such faucets reduces water waste greatly. It’s hard to explain to young children or even elderlies to cut back on water consumption and quicken their daily routines, so why not buy an automated system? It is wise to take action now and acquire such technologies before it is too late! Avoiding water wastage, recycling and finding resources for low water consumption is essential for our planets’ survival. What better way than to start at home? Know thy faucet! You may have a very sturdy faucet in your kitchen or bathroom. Most households have at least 3 faucets. The casual drip is a sneaky, dormant but grave threat! Do you know the damage a drippy faucet can do to your home economics? Let me give you an example. Let’s say you have 2 faucets, 1 in the kitchen and one in the bathroom. They both have the occasional drip, but you’ve become accustomed to the sound, it doesn’t bother you anymore, you can barely hear it! Let’s assume that it drips 10 times a minute. Not much you think? Two faucets dripping 10 drops per minute adds up to 28,800 drips per day which is the equivalent to 7 liters (1.9 gallons). That’s 694 gallons of water a year! Water preservation starts from every household, the greatest way to start is by finding the best type of faucet for you! Automatic faucets let you consume the necessary amount of water for each task at hand. Of course, at first it may seem a little bit pricey but water wastage comes at a much higher cost than monthly bills. Most water consumption takes place in the kitchen. There’s the preparation of the food, the cooking and last but not least cleaning that nobody looks forward to! Old and bad habits deceive our perception of water usage. We’re basically unreliable! But if we use an automatic faucet with motion sensors, we use the amount we need. Motion sensors detect the hand movement or the presence of a pan or pot. Once you’re done washing your hand, veggies or dishes, the water shuts off immediately. When we’re young of course we do these actions much quicker, hence less water wastage. But as time passes on we really need the aid of these environment-friendly fixtures. You may be changing your faucet because you want a newer look but be ready for some unexpected surprises! Your water lines and pipes might need some changing as well. Corrosion and rust are some difficulties you might come across so I would be a great idea to get your plumbing checked before you remove the old faucet and try to install the new one. Most new faucets come with easy installation instructions. You must determine the number of holes your former faucet has and choose the new one in accordance. If you are going from a two-hole fixture to a one hole system you’ll have to buy sinkhole covers. But if you are replacing a single hole faucet with a multi-hole system this will require the assistance of a plumber. 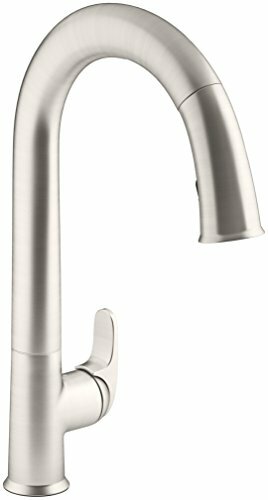 Also, spout height and overall faucet height are very important features to take into consideration. If you have cabinets above your sink you must carefully measure the space available. For over sink mounts it is crucially important to have some space behind the faucets for cleaning purposes. Usually, single hole faucets are easy to install and do not require the presence of a plumber. 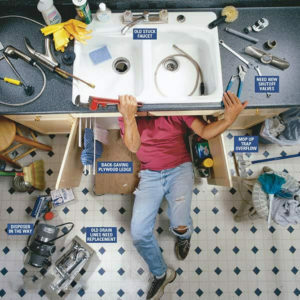 You can check under your sink to assess the required tools you need. One of the most crucial instruments needed is a shut-off valve. You simply can’t take a faucet off without cutting off the water supply! Secondly, it would be wise to check the supply tubes. See if they need to be replaced with sturdier materials and be sure to measure them in length. I’m sure most eager-eyed home repair enthusiast has their own toolbox begging for a great task but a basin wrench is a specific kind of wrench that will give access and leverage in tight spots. It’s always a good idea to take a picture of what goes where to double check you’ve assembled everything correctly! Even though you’ve shut off the water supply that doesn’t mean there isn’t water left in the supply lines you’re about to disassemble! So keep a small bucket nearby so you don’t flood your working environment! Teamwork is essential in almost every kind of home repair. Let somebody hold the faucet from above while you remove the nuts attached under. After removing the faucet, be sure to clean the old sealants from the sink so your new faucet will fit neatly. Installation of a new faucet is better performed with the manufacturer’s instruction manual. Please keep in mind that each system comes with its own requirements. It’s very wise to perform such home improvement acts at early hours for two important reasons. First, you may need extra tools so you should be able to access a hardware store after you start working. Secondly, if all fails you might have to call a plumber! Feed your new faucet into the hole from above the sink. Put in the washers and attach the nuts from below the sink. If you are using a pull-out or pull-down spray-headed faucet the hoses usually have weights around them for the hose to retract. Do not forget to place this weight or you will be disappointed later on and have to redo a few of these steps! The next step is to carefully connect the water supply lines. It is very important not to apply too much strength when tightening. Turn on your shut-off valves and then the water to check if there is any leakage. If so, you might want to reinforce that area with some plumber tape, and then tighten again. Now and hopefully your new faucet is ready to use! Please keep in mind that some systems may seem easy to install so, keep the plumbers’ number close by! There’s almost an endless variety you can choose from when it comes to elegant kitchen appliances. When you’re dealing with waterworks, it very important to choose a brand that is durable and reliable. Brand value is usually determined by the number of years the company has been in business because the experience is a key factor to success. The following brands that we evaluated are all contenders in a high demand arena. 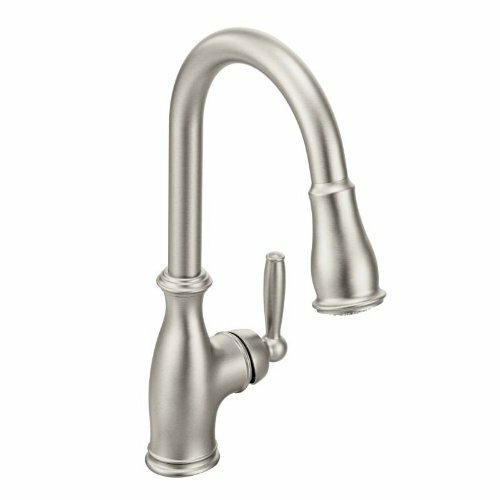 Whether you are a household wife, a stay at home dad, semi-professional cook or a Michelin Star Chef you will find the best kitchen faucet here! For instance, Kohler has a history that dates back to 1873! In fact, they launched their first line of water saving products back in 1974, therefore it’s very understandable why they are a leading brand! The Sensate Touchless series is an innovative, elegant touch to today’s water consumption sensitive users. Kohler is very sensitive when it comes to customer satisfaction. Their Customer Service department is very attentive and effective. You can rely on getting swift responses and solutions if you should need to make the call. All products come with Life Time Guarantees. They have various products within a wide price range so you’ll absolutely find a product worth your dollar. Kohler also provides about 21 models especially compliant with the ADA (Americans with Disability Act). There are over 12 colors to pick from. 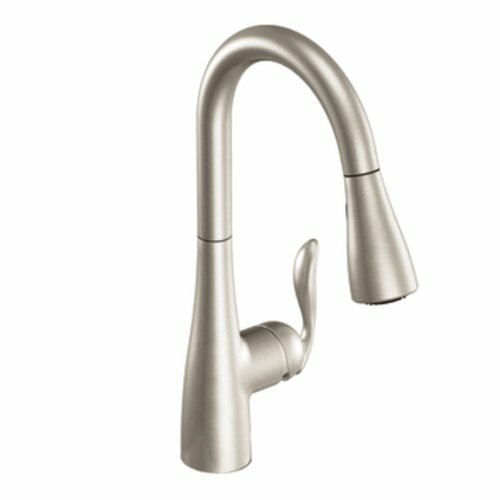 Moen is considered the #1 faucet brand in North America. They take pride in delivering meaningful, long-lasting and innovative fixtures. Their MotionSense technology is very aspiring and enables consistent performance. The brands’ promise is “Water performance for life” which makes them a reliable and trusted global leader in water delivery solutions. Their spot resistant surfaces are ideal for those who hate the time they spend tidying up after working in the kitchen. They have various types of installations whether you prefer a wall-mounted system or sink side faucet. The Reflex technology comes with a retractable hose which goes right back where it belongs immediately, hassle free! They are pretty easy to install also. With the right tools and careful reading of the instructions, you can save up to $200-$300 by not calling a plumber for installation. A brand after all of our hearts, guarding our wallets! KRAUS is a brand well known for traditional designs as well as innovative and modern-day faucets. They offer quite practical solutions with very ergonomic designs. Their sprayers are equipped with retractable hoses that are quick back in and durable. Kraus is one of the leading brands in the market. You can easily adjust the water flow in accordance with the task you choose whether it’s engaging dirty pots or gently washing your hands after completing the perfect meal. Their pull-out and pull-down varieties are as elegant as they are efficient. 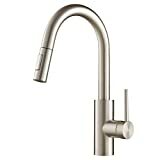 Kraus also provides models such as bar faucets and commercial faucets. The finishing options vary between chrome, oil rubbed bronze, satin nickel, stainless steel and stainless spotless black onyx, and choose if you can! DELTA is a brand for consumers looking for technologically advanced faucets. They have a variety of 40 different models that come in about 10 different colors. You can be sure that you will find the best faucet type suitable for your kitchen. A kitchen faucet flow rate is between 1.5-2.0 gallons per minute, which is a very conservative and water friendly rate! Their motion sensors detect the movement of your hand within a 4-inch range. Their magnetic docking system keeps the sink area tidy, Diamond Seal technology prevents leakage from the inside. Water is a resource we cannot live without! We drink it, cook with it or wash with it. Learn how you can contribute to saving our water resources! A dripping faucet can be more devastating than annoying! 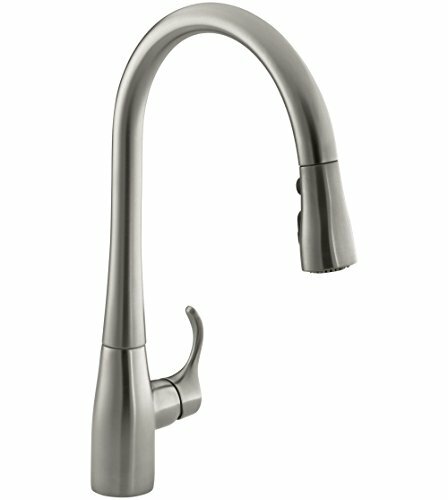 Find out how you can cut back on water consumption, yet still, have a stylish kitchen faucet. You can choose a touchless kitchen faucet with motion sensors which stop the flow as your hands pull away. You can prefer a system which guarantees that it will not drip or malfunction years after its installation. Whichever be your priority, know that you can make a difference. Classical or modern, stainless steel or spot resistant finish everything you need to know is here. Look at all the varieties of models and specialties these different brands and types of faucets have to offer. 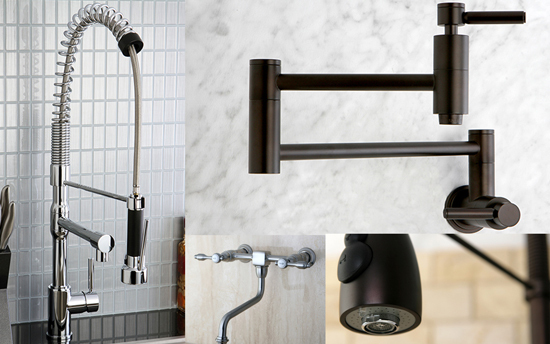 We summed up the best kitchen faucets for you. Discover what you really need, what you really want and see what the kitchen faucets reviews have to offer you. Whether you are cooking at home or are in a busy restaurant kitchen, these leading brands have the perfect model for you. Maybe you would like to bring a restaurant’s professionalism home or the warmth of a home into your restaurant. Whichever scenario may it be, your solutions are a few clicks away! You deserve a kitchen faucet that your eyes enjoy as much as your hands do.